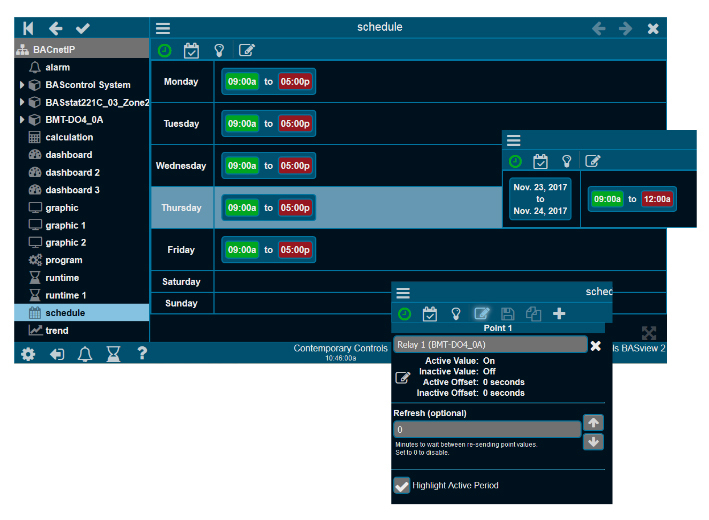 Schedules allow for control of several points based on the time of day within a seven-day week. A schedule is active if the current time of day falls within one of its specified time periods. Up to 32 points can be controlled by a schedule. An active and inactive value are defined for each point. For example, the schedule is active from 8 am to 6 pm and a setpoint is modified to 72°F during active periods and to 78°F during inactive periods. Each day of the week has a horizontal bar where time periods are displayed. These settings can be changed if the current user access permits it. Schedules are easily created. Daily entries can be easily copied to other days. Exceptions to the rule – such as holidays – can be entered to override the schedule. The points list displays all points affected by this schedule – the active/inactive values of each point and the number of seconds by which to offset the changing of this point. Offsets allow points to be staggered on or off to minimize demand spikes and to sequence equipment in the proper order.